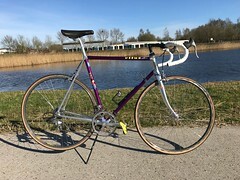 For very little money I've just bought another complete track bike. It's exactly my size and almost the same as the ALAN. I bought it from a former track & road racer who I know pretty well and lives nearby. He stopped racing some years ago and now he sold all his stuff. For a reasonable "frame only" price, I got the complete bike. By selling the redundant parts, I can pay the additions costs for this project and maybe even earn something. Almost for sure is that this bike isn't gonna cost me anything extra. I'm still not 100% sure how I will equip this bike, but it will be difficult to call it "vintage". It's going to be a nice and good everyday track bike. Not necessarily good old Campagnolo and similar stuff from the 1970's and 1980's. The frame is pretty old, but for the rest it's going to be more modern. 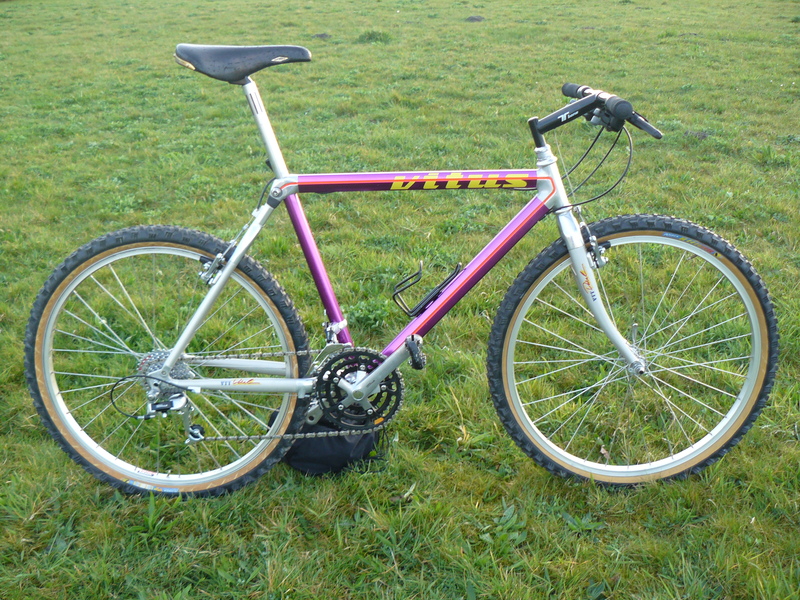 The frame is from steel Columbus tubing. This "Reco" frame was originally built by Ben Regter (Apeldoorn) for Aart van de Kruisweg. He won several national championships on it. Later it was sold to someone else and repainted in the actual (ugly) colours. The bike will be completely stripped. After that, I'll have frame and fork shot blasted and powder coated in plain glossy black. Hopefully porter7474 from London can help me with new vinyl stickers. The parts of the "old" bike? The wheels are lovely. I hope that I can get enough money for these beauties. Especially the Mavic 520 hubs with industrial bearings are great. Perhaps I'm going to sell my Miche clincher wheels and keep these Mavics with Rigida rims. The crank set is a bit odd (Sugino with 151mm BCD), but it's 165 mm and it came with 5 Campagnolo Record rings. I'm trying to sell it, but if I don't get enough, I'll keep them. I'll never gonna get a cheaper pair of 165 mm track cranks. Good on smaller, steeper tracks and good for the kids in future. Unfortunately not compatible with the Campagnolo chain sets I already have. The Seat post is a 27.2 mm Campagnolo Record, so, that will stay in this bike. 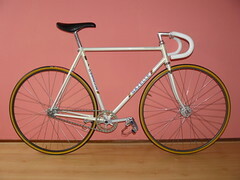 The handlebars are nice Cinelli 65-42 without grooves, so that's also ideal for this track bike. The nice Cinelli 1R stem is 13 cm, so, just a bit too short for me. Hope that I can sell it. The saddle is a very nice, black Selle San Marco Rolls, but I think that I will sell it and put a Concor saddle in its place. Any new parts? Probably yes. Perhaps the Campagnolo C-Record cranks that I've bought earlier this year, otherwise a set of almost new 165 mm Dura Ace cranks that are up for sale. Black tyres like Vredestein Fortezza Tricomp, of which I already have one and seem to be quite well on the track. Otherwise I can use my black Navigator wheels with black Continental tubulars. I can still choose between a 14 cm Cinelli 1A or a 3ttt stem of the same length. Both are in my garage. Dura Ace SPD-R pedals don't match well with Campagnolo cranks, but that's just an emotional thing. So, easy to get over it. 2 pairs in my garage. Topped with new black or white (cork or plastic?) bar tape, the new track bike will be ready later this track season.